just found some issue, on the left picture show the initial scene when i start the program, on the right picture shown when i move the direction light abit. The shadow seem go wrong when i edit position, it suppose to be block by the middle wall. Any idea? Can you tell me how you went about integrating SharpDX directly? Do you mix the approach with some things still done by monogame? Now to you question. I still work under the namespace of monogame. After adding the SharpDX references i mix the code. But this must be done carefully, because monogame under the hood works different from what i have been used in SlimDX. In monogame most of the time things are not applied to directx until a real draw call is started an then there are mechanism which hide some things you would normally do directly. The trick i did for example was to write a converter back from monogame rasterizer state to sharpDX rasterizer state. Once you know how to translate things, this is no more necessary but "for the conversion" process this was helpfull. I will send you a community mail with that part of my Code. I hope this could be a little help. You are a professional and will right away understand the code. @kosmonautgames This is awesome but I can't find any mention of the license... any chance you could add a MIT license to this project? Sure, I guess any license is better than nothing. I recall that someone specifically said „no MIT please” but I don’t remember what that was about. However I'm reaching the point of "I won't be able to do anything like this on my own" and thoughts are rapidly moving into "I'll just take Kosmonaut's code and adapt it to my game" So as people has been asking I'd love if you please could include a license to the project to know what to expect in the future when reutilizing the code. I also have a question about shadows for lights. It seems there are 3 configurations selectable with g_UseDepthStencilLightCulling: None, DepthBuffer and DepthBuffer+Stencil. However I'm unable to appreciate any difference between the three, other than DB+Stencil takes like 50% more time on my HW. Could you please give an overview explanation what are the differences between those methods and their strengths/weaknesses? I am on mobile right now, I’ll get back to your question when I find time. thanks for your time, there's no hurry in any of my questions. I'm targetting the directional light now but I'm observing a problem. I've taken the source code at github as is, commented out all point lights, and removed comment for the directional light. The light looks good until moved. When moved, some shadows disappear. After making the video I found that the directional light "going up" shown at the end of the video can be alleviated with the shadowDepth parameter so you can ignore that part. And anyways, I won't need a shadow so high. 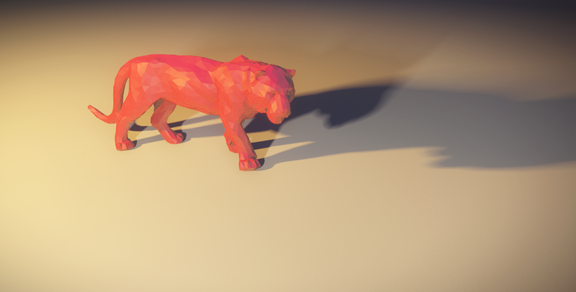 However I'm unable to understand nor find why the shadow disappears once you move the directional light. 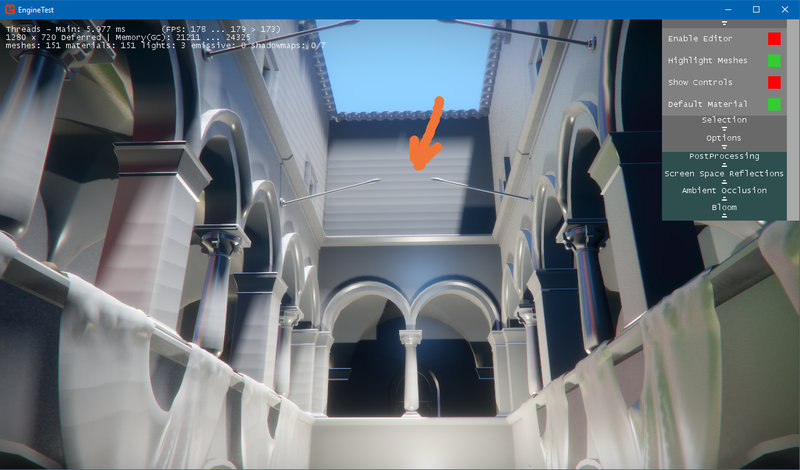 At first I though that maybe the top roof geometry was being skipped because of frustum culling, but I removed the culling forcing all objects to be rendered always ( bool isUsed = true; in MeshMaterialLibrary.Draw ) but the problem persists. Any ideas on what could be causing that? I've been playing a bit with the parameters but I've found no combination that works. Hi Kosmonaut, thanks for the answer. I tried to remove all ifs so that it always enters the light generation, but the problem persists. 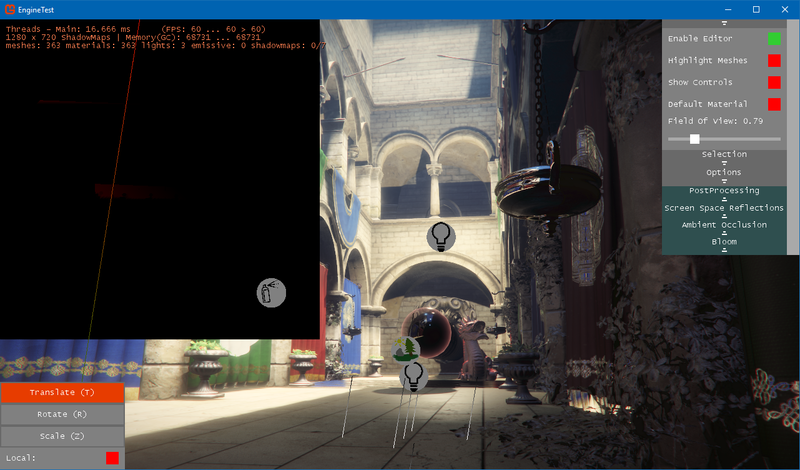 I've rendered the shadowmap for the first frame and subsequent frames. It is rendered differently. p.s. in the screenshots I forgot to disable the point lights, so the floor level looks lighted and with shadows, but most of the light as well as all the ball shadows come from the point light. maybe should be if (lightViewPointChanged || hasAnyObjectMoved) ? EDIT: I'm not sure about the problem, I couldn't replicate it on a quick test. Maybe I didn't delete all point lights. weird, it happens to me all the time even without removing the point lights. Just git clone, uncomment the directional light (I have to change an enum otherwise won't compile), run and move the light. That's something I thought last night that is also puzzling: The line I'm commenting is common to both Directional and Point lights. If it fails in Directional lights, why doesn't have the same problem with Point lights, if most of the code is the same? What MG version are you on? 3.7.0.1549 here I'll try to update my drivers later just in case. ah i understand your problem now. I thought all shadows would disappear. I will check it out. 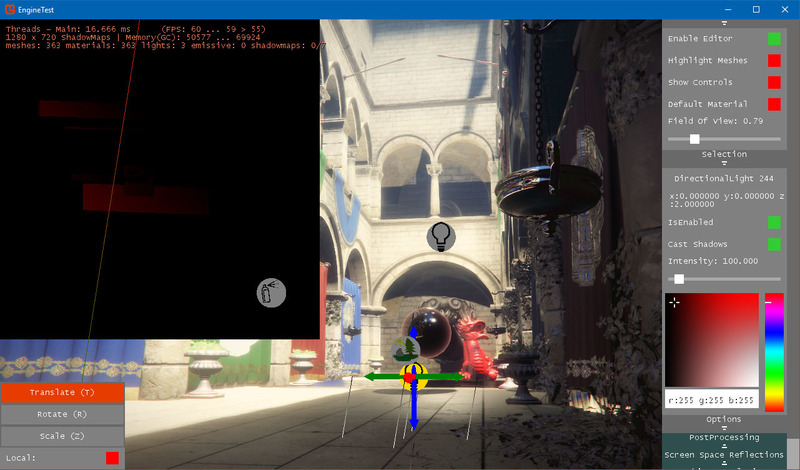 I fixed the problem with this commit and i also fixed the SSAO aspect ratio bug. I'm still playing with directional lights and I found banding when integrating it in several scenes of my game. After some dwelling I realized that the problem also appeared in the DeferredEngine, but only became aparent when switching to Default Material. Any ideas of what can be causing this? ZBuffer precision maybe? Banding is a problem in most 3d engines to some extent (see unity/Unreal/CryEngine) and then have the light be very close to a surface. It's a very known issue because of shadowmap precision, you will find a lot of resources on that if you google shadow banding. 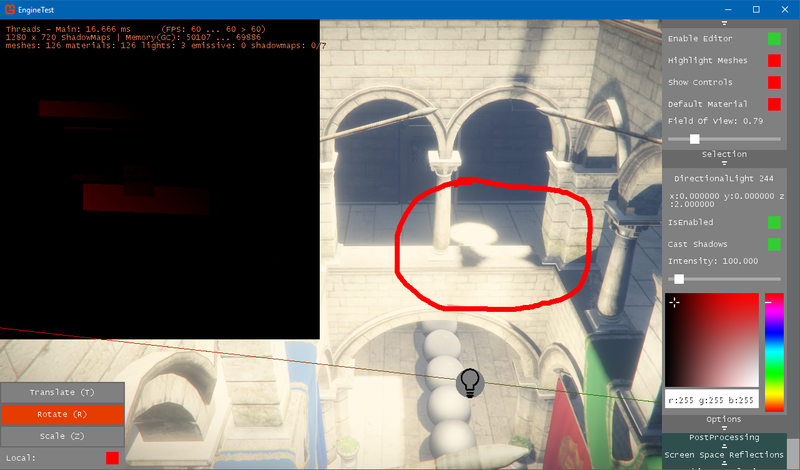 A typical way to change this behaviour, is to add a little bias for the shadowmap. You can change it by going into the console (or Gamesettings) and playing around with ShadowBias. Big values will lead to objects looking floaty though. EDIT: I'll make a patch that supports the changing of this value a bit better, i noticed the code was not good enough. thanks for the banding explanation, I was aware of the bias and floating objects, however all examples I saw on internet where showing this problem as "shadow acne", so I wasn't sure if this was the same problem. When you reconstruct the position with the depth buffer, i.e. what space is the resulting currentPos on? I'm trying to adapt the cascade shadow map example from Tim Jones and requires the positions in world space, but I'm struggling to get that position in world space because I don't quite understand what space I'm on in the first place. Thanks again, and sorry for the flurry of questions! I wasn't searching for it, but I realized that changing the shadow filtering type of the directional light removed the banding. I think the banding in SoftPCF3x/5x is caused by CalcShadowTermSoftPCF, which apparently is not using the DepthBias. Hello Kosmonaut，deferred engine is a great work,but sadly I couldn't build the project. Here is a ArgumentNullException in Main function calling. My environment is VS2015 update 3 with MonoGame 3.7.1.189.